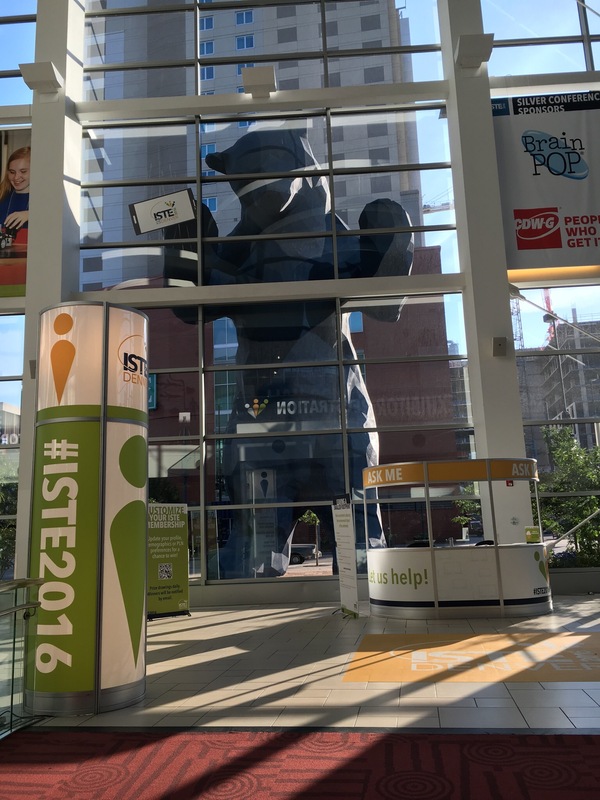 #ISTE2016 – 3 Great Ideas Just Aren’t Enough! Flippity– When Kenneth Griswold presented this tool at TeachMeetISTE, people literally “oohed” and “ahhed.” Flippity allows teachers to create a student randomizer, just by utilizing your Google Sheets. All you need to do is have a roster of students, put it into Sheets, publish the sheet to the web, and you’re ready to go. Even more exciting? Flippity can automatically group students to the number of your choosing. No more on-the-spot scrambling if a student is absent or your numbers are off! Switcher Studio– Steven New (also a presenter during TeachMeetISTE) shared this really interesting tool that allows teachers who create their own digital content to use iPads and iPhones to broadcast and edit live video. There are also capabilities for multi-camera production, too (3 additional cameras if on the same wifi network). Then, stream to popular streaming platforms for live viewing. ZooKazam– This was another crowdpleaser that Kyle Calderwood showed us at TeachMeetISTE. 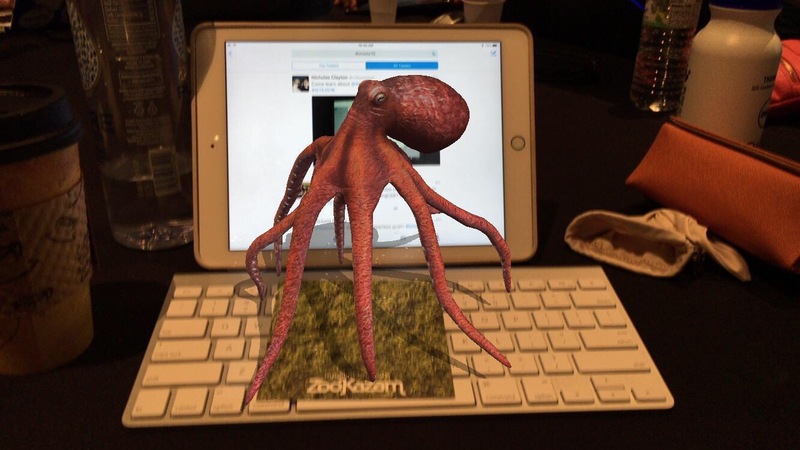 ZooKazam allows users with the aid of a “target” (print online) to have augmented-reality animals appear on any surface through the use of your iPhone or iPad camera. Kyle is also one of the TeachMeetNJ organizers. Photo Apps: Bill Selak presented his session, “Iphonography 101” and shared a number of apps that take photo editing to the next level. Snapseed allows you to adjust color, focus and crop. Mexture allows users to integrate different textures with their photos. TouchRetouch was particularly interesting to the crowd in that the app provides users with the capability of easily erasing elements in a photo. Thinglink– Liz Calderwood, also a TeachMeetNJ organizer showed off this real neat tool where you can take any picture (or “thing”) and add pinpoints to it. Then, within these pinpoints, teachers or students can incorporate links, videos, other pictures, etc. This allows students an opportunity to incorporate visual models to show their learning. Really cool! Symbaloo– Symbaloo is a bookmarking tool that creates a user homepage on all devices. It presents all of a user’s favorite websites on an easy, icon-based page. Good tool if you want to curate a number of sites for students, or for keeping track of your own sites across devices. Historypin– This one, which I saw during “101 Web Tools” (presented by the people from SimpleK12) was really amazing. Historypin is a website where users can upload documents, photos, videos and more, and then tie it to a pin on a map. The purpose is to build an interactive map that tells the story of a place through the eyes and mouths of those that live there. Goosechase– This was SO FUN. During the ISTE session, Gamify Your Classroom, Marty Creech and Britanny Guy taught us about how to use game design to increase motivation in students. They led the session through this really fun and interactive scavenger hunt app, Goosechase. Goosechase lets students (or in this case, teachers) complete a series of tasks and earn points on a leaderboard. In our session, we got to high five other groups, and also learn about gamification via articles uploaded to Goosechase. 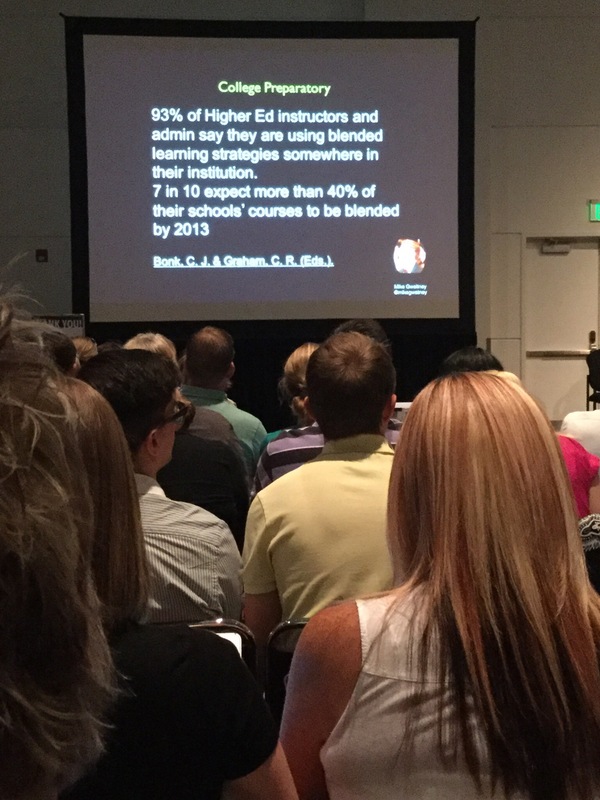 DocentEDU– This is one tool that I actually knew I wanted to check out coming to ISTE. I had played around with DocentEDU briefly this school year when I saw someone mention it on Twitter but didn’t know much. It allows teachers to turn any website into an interactive space via a Chrome extension. You can embed questions, videos, links, notes and more on the surface of any website’s page. Really great way to create engaging content. Their CEO, Matt Nupen was a really nice guy, too and seemed really helpful. Yes, ISTE had me walking away with a bazillion new apps, programs, websites, and tools that I want to use right away in the classroom. But, for me, I got the most out of hearing about others’ philosophies, ideas, and mindsets. Jon Bergmann, Thomas Arnett, Vicki Davis, Mike Gwaltney, Aaron Sams, and Stephanie Sandifer led a panel about blended learning, and I walked away with a new commitment to how I want to structure my classes. These are things we should be paying attention to when considering student success. Something that really hit home during the blended learning session was the idea that “distance can be a positive principle.” Many of us know lots about flipped classrooms by this point, but the panelists here made it clear that it isn’t just about creating videos for home viewing. In fact, they talked about the value of having students view teacher-created content in class, while the teacher walks around and helps students who are ready to discuss. The panelists also discussed the importance of creating a workflow system that works for your blended learning model. 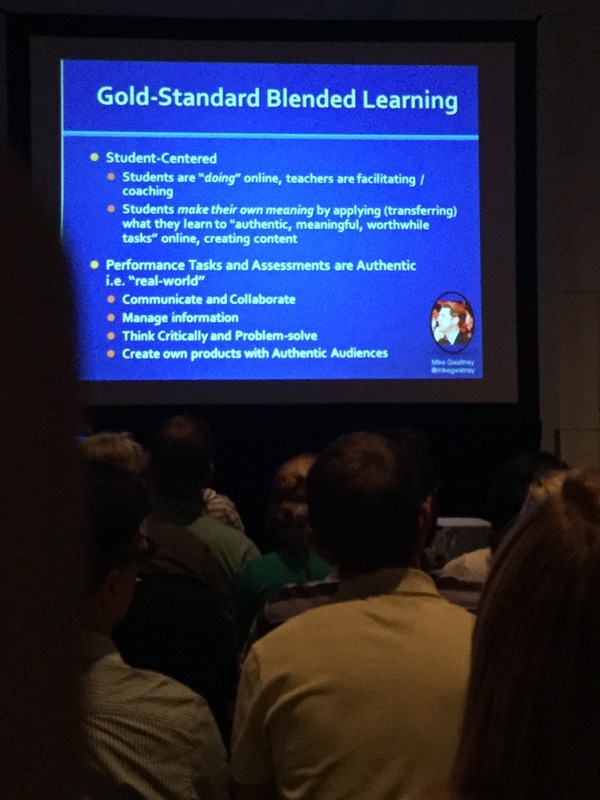 These are the hallmarks of a succesful blended learning model. Pretty much, I walked out of blended learning realizing more than ever that we as teachers have to give students more opportunities to demonstrate and articulate authentic learning. Speaking of articulating student learning, another great session was Building a TED Culture in Your Classroom. I love TED talks, and what really makes them meaningful is the vast library of free, accessible videos they post on their website. TED makes it possible for people around the world to access high quality, engaging talks from the world’s greatest minds. This workshop detailed how teachers can leverage the power of TED in their schools by having students and community members deliver their own talks. Jimmy Juliano and Laura Grigg, teachers in Lake Forest, Illinois, walked us through their story of first starting a TED Club in their school and then eventually organizing a community TEDx event. By the end of the event, I was super jazzed and trying to figure out how we could do this in my own school. What I like about the TED talk model is that it gives students a framework for reflecting on their learning. 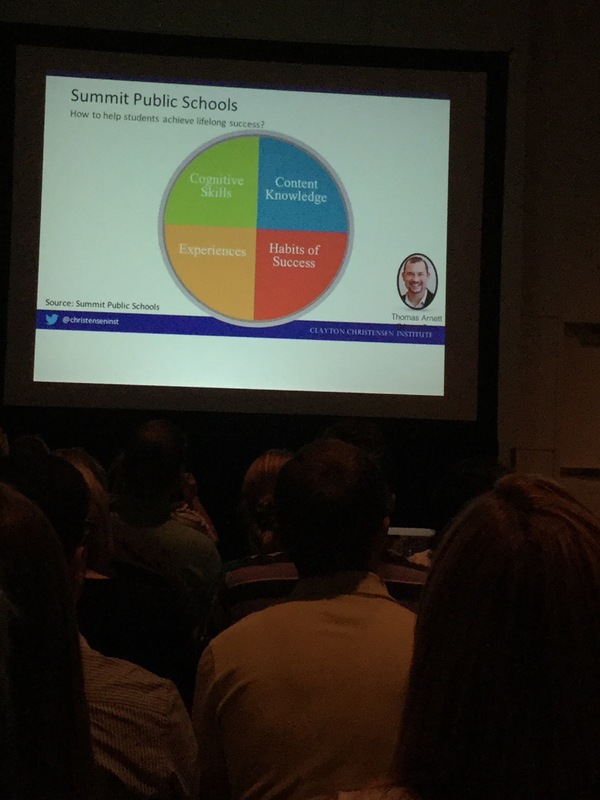 Many of the teachers I saw at ISTE2016 focused on getting away from the “read a PowerPoint verbatim” model and instead, getting to a place where students do a thing, and then present on their process. TED is a great way of fostering this kind of thinking. 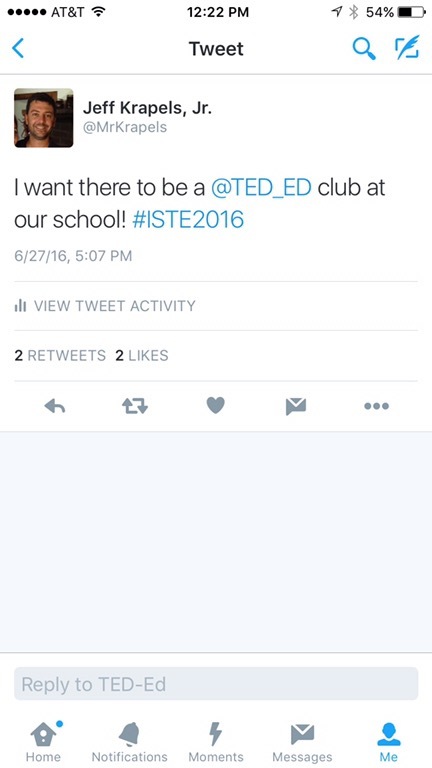 Of course, I am leaving out so many of the other ideas I heard at ISTE. 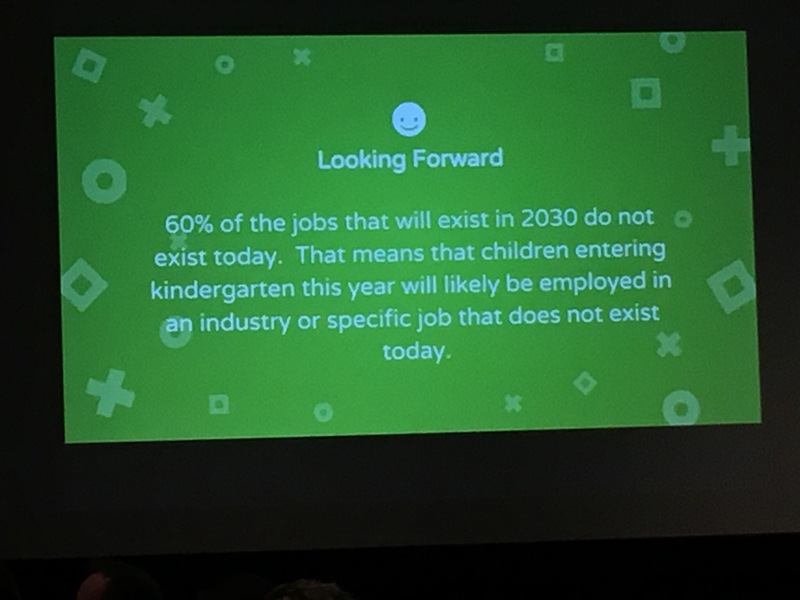 But, as I am sitting here in the airport awaiting my flight home, it’s becoming clear what ISTE was really about–connecting educators with other educators. I was privileged to listen to some wonderful speakers. We started off with a fascinating keynote from futurist Michio Kaku, who talked about all the ways that technology will make our lives easier (and scarier) in the future. We are currently preparing students for jobs that we don’t even know about yet. 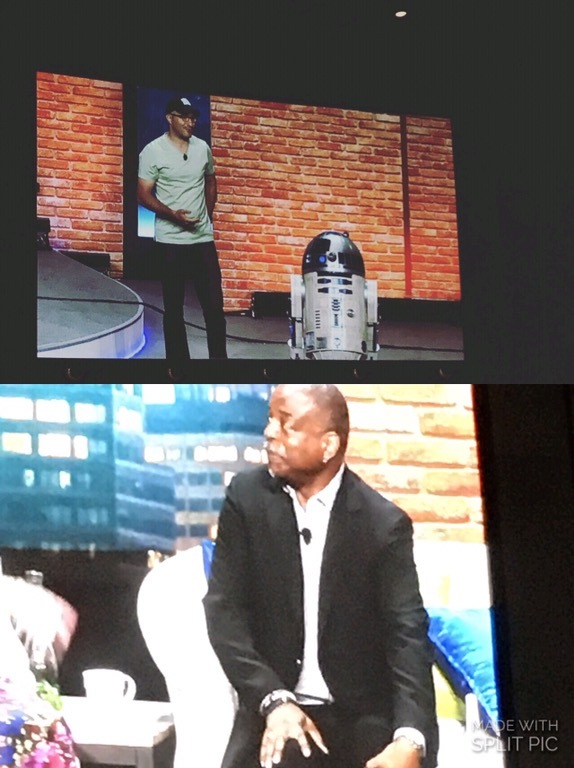 Tuesday morning, we saw R2-D2, LeVar Burton, and Princeton professor Ruha Benjamin (that’s still a strange combination when you say it out loud). What a wonderful day when you can both nerd out over R2 and be moved and inspired by Dr. Benjamin. Dr. Benjamin spoke in a way that inspired and challenged my ideas about education and the world we live in. 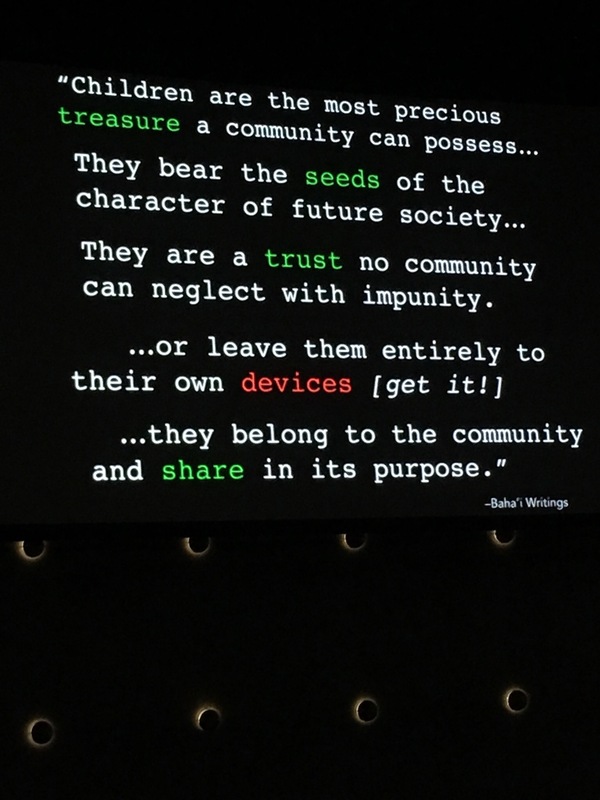 Here we were, sitting there in the middle of this educational technology conference, and Dr. Benjamin’s keynote touched on the human element of things. It was a perspective-gaining moment and reminded me that once again, as teachers, the shiny toys are fun but we musn’t let them distract us. We’re in the business of equipping students with the tools to be better learners and compassionate people. Our topic for this week is a pretty vital one. We all teach our hearts out from September to June (or your district’s equivalent), but let’s face it–like the kids, we teachers look forward to the summer vacation too. What many of my non-teacher friends usually don’t realize is that teachers do not just spend their summers sitting at the beach soaking up the sun (well, not entirely). For many of us, summer affords us the time we so desperately crave during the school year to think, reflect, and recharge so that we are our best versions of ourselves on Day 1. This week, you’ll see how we are many times more excited to return to our classrooms after an experience in a far-off place. You’ll learn how reminding yourself why you love your content is a revitalizing practice. And finally, we’ll see how sometimes, a long break from school actually provides a wonderful chance for learning. What can you do to reset and refresh during summer break? I hope you enjoy–both this entry, and your summer. For many different reasons, I believe traveling is one of the best ways to recharge your batteries after a long school year. By planning a trip you give yourself more than just a goal of getting to the end of the school year–you give yourself an event, however big or small, to look forward to. I plan and book most of my trips in the middle of March or early April so that I have extra time to research the sights, restaurants and activities of my destination. The trip is paid for during the school year. For many teachers who don’t get paid during the summer, this is another nice perk. Traveling also gives teachers an opportunity to learn more about the subjects that they love. I am a high school social studies teacher and traveling has given me the opportunity to see and experience things that make my classroom a richer environment for learning. By visiting places like the Anne Frank house in Amsterdam, Robben Island in South Africa where Nelson Mandela was imprisoned, and the Killing Fields outside of Phnom Penh, I have been able to transform my lessons by providing real world insight into these events and making the information presented in class more tangible for students. Finally, the most rewarding aspect of traveling is that of a human element. So much is lost when we simply learn about something through books, videos, FaceTime, Skype and social media. Yes, the facts are important but there is no substitute for actual life experiences like having a quiet pint in Dublin and talking to the locals, walking through a night market in Chiang Mai and smelling food being cooked in hawker stalls in the humid night air or having a delicious meal in the shadow of the Eiffel Tower at a relatively unknown restaurant. These experiences are what fuel my desire to go and see (or in some cases revisit) another part of the world each summer and allow me to return to a profession that I love each September recharged, revitalized and excited to start another year. After I launched into my usual commentary on modeling reading for enjoyment, I remembered something a veteran teacher told me during my first year in my current district: “To an extent, we all have to be cheerleaders for our material.” I talked about how teacher enthusiasm is a key to developing student interest—if they see that we like our material, they grudgingly end up coming along for the ride, and then realize that they liked the ride more than they expected. The summer, for me, needs to be about recapturing that joy that we all have but sometimes have to fake as the strains of a school year weigh on us. Live without bells and schedules: if I want to read, I read, but if I want to play Candy Crush, I’m playing Candy Crush! Next, get out and celebrate and embrace your nerdery. We all got into this job because we love the material we teach and we like discussing that material and bringing it to other people. Get back to the source—read books that grab you, write for fun, visit historical sites and museums, see the productions you just didn’t have time to see during the year. Talk about them with your friends and family. Engage with your subject because it brings you joy—not because you need to break it down by a set of standards. By unplugging the lesson planning parts of our brains, we get to recharge our batteries and approach September with the rose-colored glasses of our first teacher September (without that first September terror!). So, Tom and Kelley pretty much stole my ideas for this post. I fully endorse both of the ways they choose to refresh over the summer months. In fact, when Kelley sent me her great idea, my wife and I were at Barnes & Noble, in the middle of our annual summer book splurge. But, what I decided to discuss here is how summer is the best opportunity for teachers to learn. Yes, I became a teacher because I wanted to work with kids, and because I love my content, and because I couldn’t imagine doing anything else. But, I also love to learn. So much happens during the school year, that sometimes it is easy to forget this. So, for me, summer (in addition to resting, reading, traveling, and spending time with those I love) is about finding some new ideas for next year. I’ll pick up one new book that may help me in the classroom. This summer, I’ve been moving fairly quickly through Kelly Gallagher’s In the Best Interest of Students. It’s a great read and takes a deeper look at the strengths and weaknesses of the Common Core standards, while also providing great classroom strategies. Gallagher’s website (linked above) is a great resource too, or follow him @KellyGToGo. I also like to attend conferences or other professional learning when possible. Last year I found out that I would be teaching a course, “Literature and Philosophy of Asia.” While an amazing class, I really had very little schema for teaching it. Luckily, the National Consortium for Teaching about Asia runs a fantastic week-long workshop on Teaching East Asian Literature in the High School at Indiana University. This experience was so valuable for me. What I learned there in a week will undoubtedly help me for the rest of the time I teach this course. I’m finishing this entry about a half-hour before I leave for Denver, Colorado to attend the ISTE 2016 conference, an international expo and conference for educational technology. I am beyond excited, as I’ve never been to an education event of this magnitude, and I’ve been connecting with other teachers attending ISTE for the past few months. I’ll also be joined with some of my fantastic colleagues, and I am grateful that I will have this opportunity to do some real reflection and learning alongside those that I will be working with next year. My hope is that I will be able to share many great ideas over the next few days as I’m going to be flooded with all sorts of cool stuff in Denver, so check back next week! Thanks to the contributors, and please, shoot me a comment either here or @MrKrapels if you’d like to add some of your own great ideas to this blog. Call for ideas: What can you do to reset and refresh during summer break? If you have an idea, send it via the contact page on this blog, or you can reach me @MrKrapels. What are you doing in the classroom to facilitate growth mindset in writing? Most students inevitably make the mistake of regarding writing as a product rather than a process, and therefore they often produce poorly edited work and then either ignore or bristle at the feedback given to their product. The most obvious solution to this problem is the use of drafting and revision in any essay to move students toward a growth mindset. Still, thoughtful revision is hard to come by. 1. It can be prohibitively laborious to grade multiple drafts of an essay, especially if you believe that writing more is one way to make students write better. So, I attack an undeclared position. I have students turn in a full draft of an essay. Then, I grade a single paragraph in great detail, providing thorough feedback on what weaknesses are present and how to address those weaknesses. I do not read the rest of the essay in this draft. Students do not know what paragraph I will assess – it may vary from one essay to the next – but they are responsible for applying the feedback from this one paragraph to the rest of the essay. For instance, if a student receives feedback that his quotations are long or unincorporated in paragraph two, he must make improvements in this skill throughout the essay. As an English teacher, one of the toughest things to teach kids about writing is that it’s a process – students tend to get an essay prompt, let it sit in their bags for about a week, realize that the due date is coming up, experience a few minutes of panic, sit down, write, and submit. Then we, as teachers, grade those papers, cover them in comments, and students look at their rubrics (or just their scores), and say, “Wow, I can’t believe she gave me a ___.” The letter or number that fills in that blank is what dictates the tone of the “wow,” but we undergo the same process day after day, year after year; lather, rinse, repeat. Fostering growth mindset in writing is absolutely essential if we’re going to get students to break that cycle. There are a whole slew of ways that we can do that as teachers, but the great idea that I want to share with you today is about what we can do before students hit the “submit” button to help students gain ownership of their writing, and to engage in writing as a process. Whenever my students have a paper due, we immediately go into our writing routine, beginning with brainstorming ideas for how to address the prompt provided. We go back through our notes on the text, review the quotations that we’ve pulled out for discussion, and revisit our “trouble spots” to ensure complete comprehension. Then, students are given about a week to go home and begin working. Here’s where it starts getting good: I spend three full class periods (we have 45 minute periods, and all of our classes meet everyday) conferencing with students, and it’s the content of those conferences that really drives their learning. Students have to come to conferences with three specific questions about their writing. I give them examples of what good questions look like (“I’m having trouble with my topic sentences; what can I do to make this one more argumentative?”) as well as what bad questions look like (“Can you read my introduction?”). The questions they bring to me become the driver of our conversations – students direct their learning by assessing their own strengths and weaknesses. This process is, of course, scaffolded – students keep a log sheet in their writing portfolios where they track their strengths, weaknesses, and plans for improvement based on feedback from each essay. While I’m conferencing with writers, students are also sitting in pods – each one directed by one or two “student experts,” and each one dedicated to a different writing topic. Experts are chosen by a combination of their input and mine – students volunteer to act as experts in particular areas, I compare their suggestions with my observations, and then each student is named an expert on one day in one area. Once our conferences are over, students have a whole list of suggestions for how to revise their work before hitting submit, and writing has gone from a one and done assessment, to a multi-step process. I surveyed my students at the end of this school year, and the value of conferencing and the three question protocol bear out in the data. Nearly 56% of students surveyed said that conferences were essential in preparing to write. Not only that, but they noticed improvement in their work; nearly 17% felt their writing improved significantly, while an additional 47% felt they improved measurably. In the narrative section of our survey, I asked my students to name one thing that I should absolutely continue to do with my students next year. Many mentioned our conferences, including one student who wrote, “The one-on-one talks at the beginning of an essay. Talking with you one-on-one really helps and your advice that is specific to me is extremely helpful.” When I asked them what I could do to make the class even better, a number of students said that they’d like to have even more writing conferences. So, how does all of this add up to fostering growth mindset? By asking students to engage with the three question protocol, I insist on student ownership of learning. They track their progress on their log, and their feedback is targeted at their questions. By closing the gap between my assessment of their work and their assessment of their work, we can shift from “getting” grades to “earning” them. The log allows them to see their growth, and when the next paper comes along, they know exactly where to focus their efforts. This great idea is still in its infancy, and while I’m happy with the results this year, I know that I’ll continue to tweak the process – after all, if we’re going to insist on growth mindset for our students, we must model it for them as well. Every student has her own unique set of problems or challenges when it comes to writing, and these are best addressed one-to-one with the English teacher. Most of the time I find that the problem lies in the fact that the student just doesn’t fully understand what is expected of him or her. Progress in writing, as in all human endeavors, is not steady and constant, but goes through rises, dips, and plateaus. All such stages are normal; you should not be disheartened if you don’t steadily improve. It will come with persistence. These words were huge for me. Like most “revelations,” none of what he was telling his students was revolutionary, but for the first time I saw someone verbalizing what many students (and I) miss in the writing process. That it is a process. So, my great idea that I want to share is how I’ve used Google docs to give meaningful, immediate feedback to my students before they’ve submitted that final draft. I am by no means the innovator of this idea. In fact, I’ve received a lot of information and help on how to do this from other teachers who are doing the same thing. Kate Baker has a blog that details lots of great ways to use Google and other tech to organize your class. You can also listen to a feature on the BAM Radio Network where she talks about flipping her English class to cut down on paper grading. Another educator who has shown me how to use these tools and provide instant feedback is Catlin Tucker, specifically in her post “Synchronous Editing with Google Docs to Teach the Common Core”. So my, great idea is certainly not my own, but definitely inspired by these fine teachers. Pretty much, you have students begin drafting a writing assignment in class in a Google doc, and then you ask each student to share their work with you. This gives me the opportunity to be “in the document” with the students, while they think, plan, and write. This way, when they make mistakes, or if they can add something more to a promising idea, I am able to jump in and course correct in the moment. It’s akin to having writing conferences with your students, but instead of conferencing one-on-one, you conference with everyone at the same time. The result? Students are now thinking about their writing during the writing process. I have done this with my journalism students a lot in the past two years, mostly because I have had such small numbers. This made it easy to get to every student. It wasn’t until this year that it clicked–I can do this in all of my classes. Using Google Docs to collaborate and provide instant feedback has been so great for my students that I have seen much more commitment to the writing process. In fact, it isn’t uncommon for my journalism students to ask, “Can we have a roundtable in Google Docs?” This is music to this English teacher’s ears.